Twenty-five, and counting . . .
Two weeks ago Sunny and I celebrated our 25th wedding anniversary. At first we’d planned to go out, but came to the conclusion that we probably wouldn’t enjoy going out all that much and it was going to be very expensive, especially taking into consideration that neither one of us really has any “going out” clothes. I’d sort of wanted to buy a nice, dressy outfit, but we’re also both dieting (successfully, I might add) and I really didn’t want to get something that was only going to fit for a month or so. I did indulge myself by investing in some bits and bobs for the table, silverplate chargers, a vintage double damask actual linen tablecloth off of Etsy and napkins which are an amazing match off of eBay. Considering the price of new linen tablecloths seem to be in the hundreds of dollars range, I think the $35 spent for the tablecloth and the $12 for the napkins a real bargain. And I get to use them again. Try as I might, I couldn’t find any plates that would go nicely with what was turning out to be a very formal table, so had to make do with the Mikasa Arabella. It didn’t look quite right with the sterling and crystal, being more of a casual quality of dinnerware, but the King crab legs and Sirloin Strip tasted just fine off of them :-). And the table still looked nice. Mr. Carson would be appalled though, the dinner fork is crooked ;-). The sterling is a pattern I’ve been trying to collect for years, since I graduated High School to be precise as the very first piece was a fork given to me by my Aunt Jennie as a graduation present in 1975. It was years before I was even able to identify the pattern as of course there was no internet in those days. Finally a friendly antiques dealer was able to pinpoint it as Reed & Barton’s “Les Six Fleurs“, first produced in 1901, the year of Queen Victoria’s death and Edward’s ascendance to the throne of Great Britain. Being an antique pattern well over a hundred years old, they can be very difficult to find – and also expensive. I call this my one vice. It could be worse, I could have a closet full of clothes. At least this stuff is hard to find. It keeps me honest. 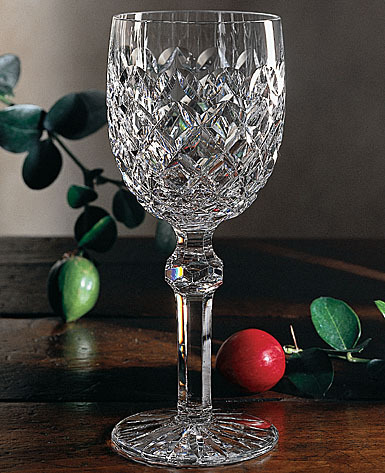 The crystal is Waterford of the pattern “Powerscourt.” Something else I’ve been collecting one . . . piece . . . at a . . . time. Mom always said I had champagne tastes and a beer pocketbook. I’ve really just now gotten to the point where I can set two place settings. The next goal is to have four place settings, then I can have company! I have, at last, and purely by accident, found a dinnerware pattern that I’m happy with for formal place settings. There was a Craigslist entry for 4 place settings of Noritake Shenandoah for $400. I was curious as to what the heck was so special about it that this lady wanted an astronomical price for it so I looked it up. Turns out she was apparently just clueless. The real value of a place setting is somewhere in the $50-60 range. However when I saw the photos of it, it looked like it was exactly what I was looking for. True, it wasn’t Royal Doulton or Limoges, but Noritake has a good reputation and is an old company. This particular pattern is a delicate floral, opulent without being over the top, and with that “old fashioned” flavor which I love. Of course it’s a discontinued pattern so now I’m collecting those as well. 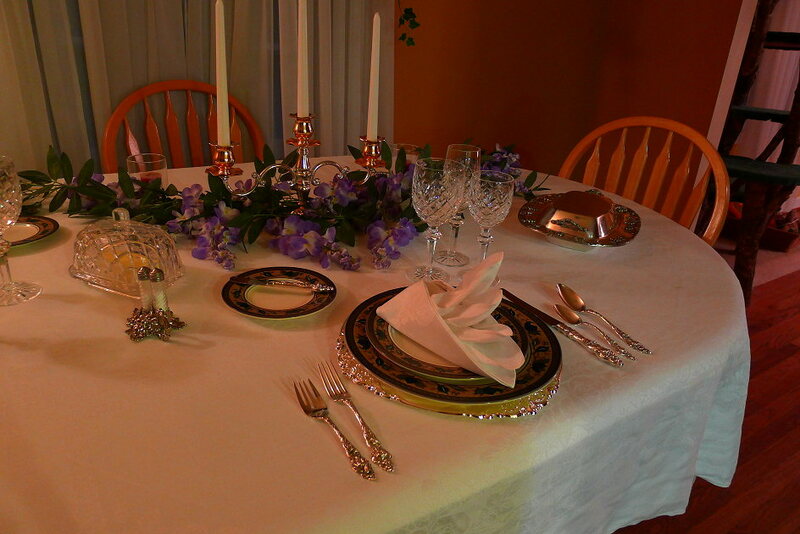 This entry was posted in General and tagged dinnerware, silver, table by Cindy. Bookmark the permalink. Been a long vacation . . .
First starts in the ground. Debbi on Captain Carrot, I presume?